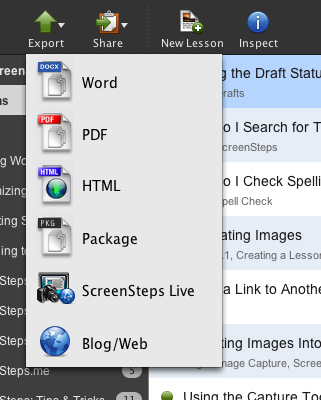 Learn how to export lessons from ScreenSteps to a variety of formats. Select the lesson you wish to export and choose Export. 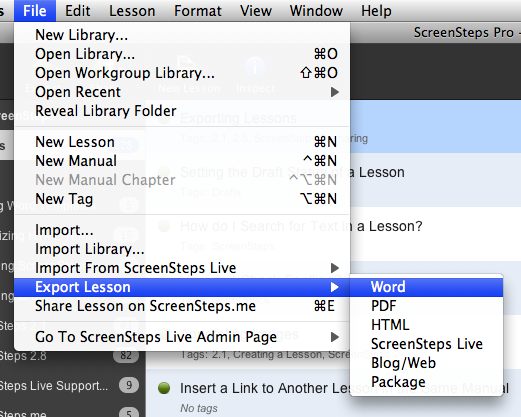 Choose whether you would like to export to Word, PDF, HTML, Package, ScreenSteps Live or Blog/Web. You must configure your account settings to export to ScreenSteps Live or to your own blog. Current blog/wiki services that are directly supported are WordPress, Movable Type, TypePad, Blogger, MindTouch, Confluence, Google Sites and Zendesk forums. You can also post to Joomla, Drupal and Squarespace using one of the supported formats mentioned. To learn more about publishing to the web please see the manual Publishing to Blogs & Wikis. Package export is only used for moving lessons between ScreenSteps Libraries. 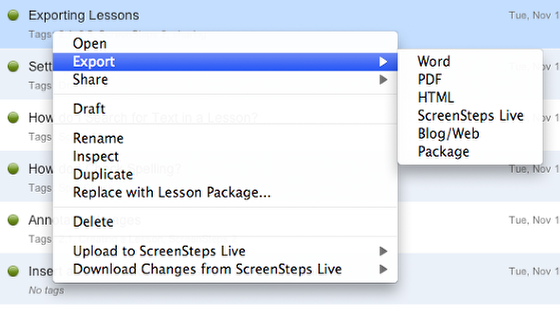 For example, you would use this option if you wanted to send your lesson to anther ScreenSteps user. They would then be able to import the package and edit the lesson. You can also select File > Export Lesson. You can also right click (CTRL + click on Mac) on a lesson to export it.